Another day, another deal on a battery pack. For just $30, you can grab yourself a Power Vault 18000mAh portable battery beast with dual-USB ports for charging two devices at once. This device would normally retail for around $100, so you are looking at a 70% discount. It might not have Quick Charge 2.0 like the Aukey we recently reviewed, but it’ll certainly charge all of your devices. 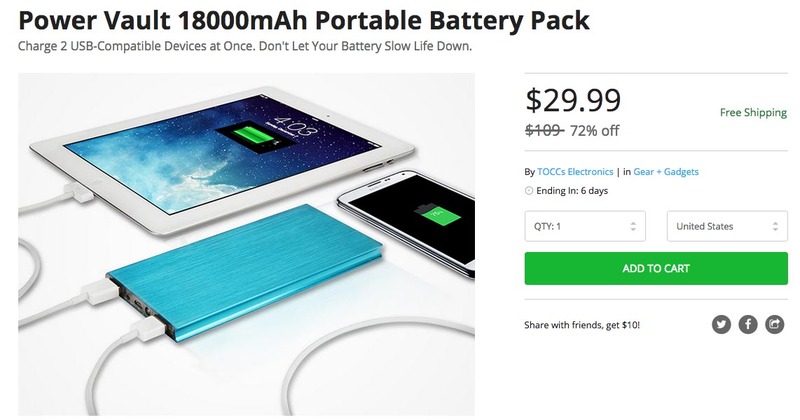 The TOCCs Power Vault 18000mAh battery pack comes in blue, should give you up to 5 full charges, depending on your phone’s battery size, and has a sleek, aluminum case. The deal is live for another 6 days.